Batsmen Tom Wood and Charlie Macdonell have signed one-year contracts with Derbyshire for the 2017 season. Wood, a Cricket Derbyshire Academy in partnership with the University of Derby graduate, featured in three first-team fixtures in 2016 and made his first-class debut in September. 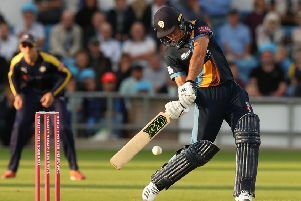 The 22-year-old earned the call-up after an impressive campaign with the Second XI, averaging 104 in the Second XI Championship with a top score of 200 not out versus Worcestershire. Macdonell also made his first-class debut for the county in 2016, against Essex in August. The 21-year-old established himself as a regular member of the Second XI, where he scored 290 runs at an average of 48. Both players were included in the team that faced Sri Lanka A in a 50-over tour match in July. Director of Cricket Kim Barnett said: “Tom and Charlie are two young players who really impressed for the Second XI this summer and went on to gain valuable first class experience. “Both performed well and showed what potential they have. The pair will now benefit from a full winter programme and we look forward to watching them develop.